For one serene hour, we were human cargo in a world of pink. The sky was Persian rose; the river, reflecting it, ran ruby as it flowed as smooth as glass. We forgot the world as we stood on the roof of the riverboat, chugging its way downriver on our third day. Down the Huallaga to the Marañón, down past the two-colored confluence with the Ucayali, where the Amazon proper begins. 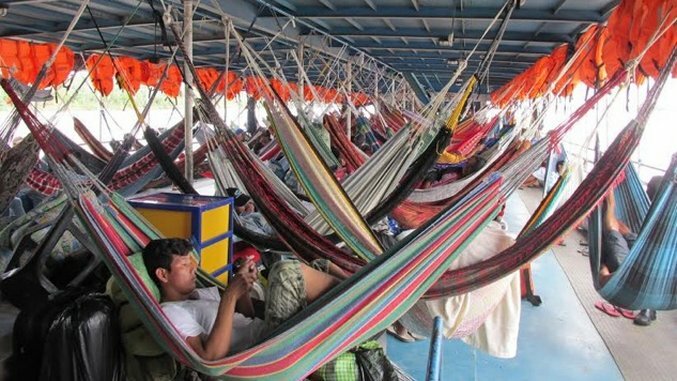 Tourists pay top dollar to witness these Amazonian scenes, but there was no room for luxury on the Eduardo IX as it made its way from Yurimaguas to Iquitos. And having paid just $45 for the three-day riverboat trip, I was happy to be just another piece of freight in transit. The port in Yurimaguas is small, hot and inefficient. I watched from the bow of the Eduardo IX as wiry men below me hauled assorted cargo from dusty trucks up sagging planks of timber to the waiting boats. Each dockworker ascended with stuttering steps, dead weights digging into their shoulders: furniture, old refrigerators and crates of beer. The Eduardo vessels are cargo boats that also carry people—not the other way around. When the cargo bay is full, only then will the captain sound the horn to mark the departure for Iquitos. If you’re late, you’ll be left behind in Yurimaguas. If you don’t have a tiny cabin, you’ll need to find a space to hang your hammock. The food bell will ring three times a day. As human cargo, you’ll be fed a muddy brown soup of something hot and sweet for breakfast, and chicken with oily spaghetti for lunch and supper. If you have a cabin, you’ll have a private space and security for your bags. If you don’t, you won’t. Only the latter answer mattered. The buzz of excitement was palpable as the Eduardo IX began to vibrate, its hull trembling as the engines came to life in the late afternoon. And while there was nothing dark or foreboding about the start of this endeavor, it was hard not to think of Kinski’s wide-eyed Fitzcarraldo or Charles Marlow in search of Mr. Kurtz. With my bag safely stored in my hot little cabin, I spent the first night in my hammock, where I drifted off to the chug-chug-chug of the engines and the subtle nocturnal sounds of one of the world’s largest river systems. I awoke to a grey day, the light sitting flatly on the jungle to either side, but unable to subdue the Amazon’s ever-powerful greens. The breakfast bell pierced the calm, calling passengers to queue up outside the cramped galley. Cabinless passengers are not provided with plates, bowls or cutlery on these riverboats, so most bring their own fork and containers to receive their daily rations, including the standard breakfast of a hot thick muddy concoction that might have been hot chocolate. It was edible, once you peeled the copious skin from the brown surface. By lunchtime, a wall of rain fell in the distance, blurring the landscape downriver like a godly thumb smudge. The Eduardo IX plowed into this deluge and rain blasted across the small upper deck area that we had claimed for ourselves, hitting us horizontally with face-stinging force. Papers flew; backpacks and hammocks were drenched instantly. So this was why all the Peruvian passengers chose to stay in the overcrowded but sheltered deck below. I swiftly retreated to my cell of a cabin, which had suddenly become a refuge, something far more than just a storage space for my backpack.